Last year, on a dusty hot summer’s day, I decided to take the slow road from Blenheim to Christchurch. Armed with my trusty little 4WD, a tent, lots of snack foods, a large swimming towel, binoculars, and a camera; I felt well prepared to enter the vast tawny landscapes of South Marlborough and explore the Molesworth Recreation Reserve – formerly a high country station – during the summer period the road is open to the public. The drive into the Molesworth Cob Cottage camping area up the Awatere Valley is around 100 km, twisting through and over a winding river valley – populated with high country farming outposts, and rabbits! Lots of them, including black ones that lolled over the warm gravelly road in the late afternoon. An early evening arrival into the camping ground – at the entrance to the Molesworth Recreation Reserve – saw a few other tents, some mountain bikes, and a friendly DOC ranger. With lovely sheltered campsites (and I spent a few minutes working out where the sun would rise and hit my tent with its warming rays first thing in the morning) I settled down to a billy-cooked meal with hardly a sandfly in sight! The gates open at 7 am, and those smart enough to shake off the early morning dew (or even a frost in summer) can get onto the road before the heat of the sun hits. I chose to loll around, exploring the area, and anticipating a meandering drive through the 80-odd kilometres, before dropping over into Hanmer Springs for a late evening soak in the pools. Sounds heavenly. 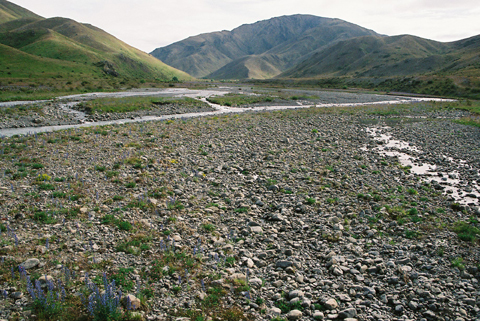 For those unused to the expansive tussocklands of the South Marlborough high country, the landscape can appear barren. But within Molesworth Recreation Reserve, a hotspot of endemic (that’s ‘native only to the area’) plants thrive tucked into bluffs, clinging to scree, and keeping their feet wet around some of the many tarns in the area. If in luck, you might catch a scree skink on the move – but I wouldn’t hold your breath. The place is vast. 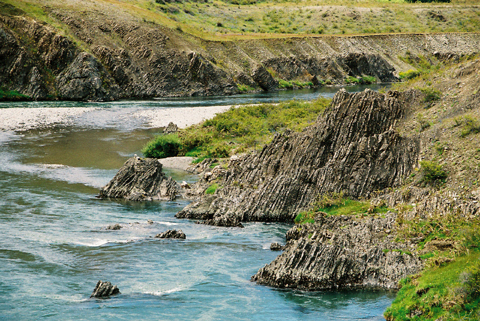 Fly over Molesworth, and you see the tawny hills stretching over 180,476 hectares of rolling ranges woven by river threads, and dotted with tarns. 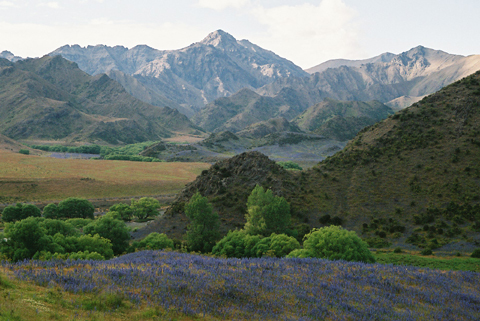 Molesworth was farmed until 2005, before coming into the public conservation estate as a recreation reserve, whilst retaining its farming operations. Its an interesting blend of ‘working’ and protected land. The balancing of biodiversity, recreational aspirations, and farming is managed by the Molesworth Steering Committee – a great bunch of people with a variety of backgrounds. Contrary to popular knowledge, Molesworth is not just open during late Dec to April 1st when the road is open – but extensive parts of it are also open all year round for 4WD, tramping, rafting and other access. Well worthwhile are trips through the Rainbow, Lake Sedgemere, and in winter, a planned hike through the Severn Hills. So, with a day of planned leisure ahead, I embarked on my Molesworth adventure. The gravel road is well maintained – and, contrary to the day before, there wasn’t a rabbit in sight! (One of the bonuses of good pest control!) Its easy to feel alone in the world out there, with stunning views of bluffs, river valleys, and more intimate stop-offs with the tiny gentians and other plants hidden from view. The hours sped past as I took out my camera and binoculars – yet again – and marvelled at the geologies and expansiveness surrounding me. The odd vehicle rambles by, with families old and young. I met workers on the road –a young crew fixing the North-South Island electricity cable link that marches like something from War of the Worlds across the Acheron valley floor. And in the middle of the day I explored in the long grasses and amongst matagouri in the hope that I might discover something yet unseen. There’s always a little bit of a hero waiting to burst out of me, and last year some of our F&B friends discovered a tiny orchid under their feet while eating lunch. So I thought, why not me, and here… After realising my botanical skills were not of the highest order, and the only orchids, hebes, and gentians I could find were already well documented, I decided to take a cue from the hot afternoon sun, and indulge in a swim. As I plunged – yes in uninterrupted nakedness – into the river, a steer trotted madly off into the hills, wondering what whitened creature was emerging from the deep pool at the bend. After a day of tawny tussocks, sun, clear waters, and gorges, the road exits the Station at the Acheron Homestead. (You have to be out by 7pm so don’t dawdle too long). I spent an indulgent hour or two conversing with some overseas visitors on the marvels of our countryside, and explored the old reinvigorated homestead – with DOC information panels providing a story about an historical era we can now only ever imagine. Over Jacks Pass and into Hanmer in time for my soak. Bliss. This year, I’m back again – but rafting the Clarence River on a 5 day adventure (still spaces on the raft if anyone wants to come – at a cost) as I explore more of South Marlborough and the opportunities through Molesworth and the new Ka Whata Tu o Rakihouia Conservation Park. Watch out for more adventures in my next blog! Great idea for an article. Very inspirational. Excellent way to share personal info about places like Molesworth for those of us who can’t get there. Thanks Debs. Has anyone heard anything for National’s plans for the high country and the tenure review program?